New Zealand has just been through a parliamentary election and elections breed dichotomies like still water breeds mosquitos. We saw the town/country, farmer/environmentalist, economic growth/environment dichotomies in play. If you are the champion of one side, dichotomous thinking encourages you to be the enemy of the other side. One of the biggest issues was around water quality with the focus on dairy farming. Its clear that we have too many cows in many catchments. The negative impacts are outlined in this Greenpeace report. But does this mean we will see the slaughter of dairy cows as one politician wanting to fuel fear declared? (There is some irony in this, because all cows get slaughtered eventually – so the more you have, the more slaughter you get). So can we break the dichotomy? Can we have fewer cows and still have profitable farms and a better environment? Part of the answer must lie in diversification. Miraka is a Māori owned dairy processing business in the Mokai Valley in the central North Island. As a Māori business, principles of kaitiakitanga (guardians of the land) and tikanga guide the business. The factory is run on geothermal power and milk waste is processed through a giant worm farm. Miraka is one enterprise of the Tuaropaki Trust. In addition to dairying, the geothermal power is used to heat greenhouses and the trust has several other enterprises. This September 2017 audio from Radio NZ features Kim Hill interviewing CEO Richard Wyeth. Miraka has maintained good payouts to farmers and is driving up the value chain reducing the need for intensification. There is diversification in the parent trust, but individual dairy, horticulture and pastoral farming units appear to “stick to their knitting”, essentially monocultural. Simply reducing stocking rates may not be the answer. The Lincoln University demonstration farm has managed to reduce nitrate leaching by 30% by reducing stocking numbers, but extracting more production from the remaining cows. We are in the early days of exploring diversifying income streams from the land. Where are those farmers that work the land to optimise returns by nurturing the diverse niches that the land inevitably provides – the lean steeper country, the riparian margins, the manuka groves and the totara remnants? Farm foresters utilise steeper country for tree planting. Riparian plantings that protect waterways from sediment runoff and capture some nutrients also offer the opportunity for crop diversification – notably, bananas in some Northland sites. Manuka groves supply income from honey and support bee populations for important pollination work. 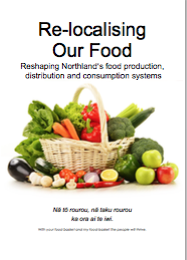 The Northland Totara Working Group is promoting the sustainable management of the totara groves that pepper Northland farms. One benefit is timber production. Examples abound – but where are those that integrate options in a way that optimises the health of the land and its ability to produce sustainably? Posts that follow this one will hopefully surface examples of farms exemplifying income diversification and kaitiakitanga. Congratulations to Miraka for pointing the way. A video from Friends of the Earth International has some startling claims about how the need for industrial agriculture is overstated. This sounds plausible, but the problem is, I can’t find this video anywhere other than Facebook – so it is difficult to find data that supports the numbers. And my attempts to link to the video – apart from a Facebook link have failed. The Friends of the Earth video claims that industrial farming feeds only 20% of the world’s population and the other 80% is produced on family farms. This video from Anna Lappé and Food Myth Busters claims 70% – and provides compelling narrative to support the movement to sustainable food systems. The landmark 2016 report from the International Panel of Experts on Sustainable Food Systems (iPES-Food) provides more detailed analysis that asserts the efficiency of agroecological farming. The report identifies “feed the world” narratives, parodied at the beginning of the Anna Lappé video as one of the “lock-ins” that help to prop up a failed system (see page 56 of the report). My city, Whangarei has plenty of green space and most houses are on sections that would provide adequate space for food production that integrates into the landscape. In an ideal world, we would have very little need for industrial farming. Exporters need not fear, as the world will continue to have a large appetite for what we can grow here in the short and medium term. The challenge for our commercial growers and exporters is how to farm sustainably. Writing this post has reinforced for me the need for sustainable food system advocates to back up claims made in video with hard data somehow. The material is great, but gets picked up and shared on places like Facebook with no way of fact-checking in this era of fake news. The 2016 Climate Change Projections for NZ predict that the eastern half of Northland will experience hotter, drier summers with less winter rain and frosts. Droughts will become more common, as will extreme weather events. Relative humidity will decrease and evapotranspiration will increase. I believe that planning our landscapes to meet these changes will increase our chances of successfully localising our food supply. Recently there has been interest in developing a tropical fruit industry in Northland. I suggest that by adopting mixed plantings of alley crops on contour with appropriate soil building techniques (such as the Yeoman’s plough on contour), water harvesting techniques (such as swales and vetiver grass), and minimisation of soil cultivation through direct reseeding, I believe that we can reduce risks while maximising production, minimising input costs, maximising soil water absorption, minimising evapotranspiration, and reduce stress on aquifers (from pollution and overuse). For instance, monoculture banana plantations are decimated by extreme weather events. The world’s main banana crop, the Cavendish, is under threat from the Panama disease fungus which already exists in Australia and there is no known treatment. Therefore, developing a banana monoculture industry would seem high risk. An alternative would be to form landscapes that maximise water collection at swales and on-farm dams (whenever we resort to aquifers for irrigating, we engage in an ultimately unsustainable agriculture). Landscape resilience could be increased by alley cropping a mixture of bananas on contour with an Alan Savory style livestock grazing system and further refine that with multi-species grazing. This would build soil organic matter rapidly and even more so with annual use of a Yeoman’s plough. Nutrient, microbe and water holding capacity of the soil could be enhanced by the addition of biochar and avoidance of soil cultivation. To increase the protection of the banana crops to strong winds and evapotranspiration, alternate alleys could be planted with trees crops, and banana alleys could be interspersed with nitrogen fixing trees such as honey locust. The bananas (which would ideally be planted in the damper ground below swales) could be planted with taro, and probably within 5 years, with ginger and turmeric. A mixed cropping landscape would increase food security by better enabling a yield in years of extreme weather. The photograph of Mike Shepherd’s New Forest Farm below, is an example of the way a farm can be designed to withstand climate change and extreme weather while providing a wide range of yields.